UN Resident Coordinator and UNDP Resident Representative in Ukraine Neal Walker and International Project Manager of the joint EU/UNDP Project “Community Based Approach to Local Development” (CBA) Hendrik van Zyl visited communities of Lvivska and Ivano-Frankivska oblast and met with Lviv oblast authorities. Among the participants of the official meeting were the Head of Lviv oblast council Petro Kolodiy, Deputy Head of oblast council Valeriy Piatak, head of commission in budget issues, social economic development and communal property Yaroslav Kachmaryk, head of department of common property, Mykola Bandry, head of the economic policy department Sergiy Kit, first deputy head of Lviv oblast state administration Rostyslav Zamlynky and the head of the department of trade economic development and manufacturing industry of Lviv oblast state administration Vasyl Lozynsky. The CBA Project was also represented by the Community Development Specialist Olena Ruditch and Community Development Officers in Lviv oblast Ihor Nazar and Iryna Halayko. During the meeting UN Resident Coordinator and UNDP Resident Representative in Ukraine Neal Walker stressed that the experience of cooperation between CBA Project and Lvivska oblast is highly important and the best practices of this cooperation are being disseminated among other regions of Ukraine. “Other funds use our cooperation as a platform for cooperation with other oblasts of Ukraine and implement their projects contributing to the community development”, stressed Neal Walker. International Project Manager of CBA Project Hendrik van Zyl highly appreciated cooperation with Lviv oblast. 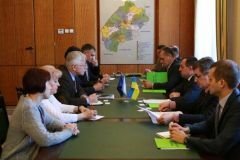 He confirmed that Lviv oblast was one of the 12 oblasts selected for implementation of urban development component. “Our cooperation with the oblast has a strong potential to become a pattern of project implementation for other oblasts”, summed up Hendrik van Zyl.